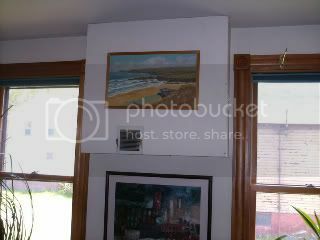 This house has been solar heated for nearly 28 years now, the glazed black box on the south wall pumps heat into the living room whenever the sun shines, consistently and reliably. It was built in the Riverside neighborhood of Cambridge, MA in 1980.
and then exhausts the solar heated air back into the living room. 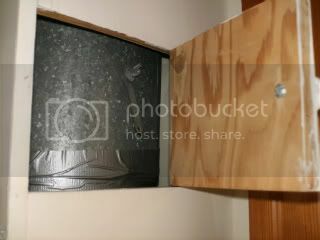 Sometimes on sunny winter days, the people who live there have to flip the damper and dump the collector's air outside to prevent overheating. It has worked unfailingly all these years without any major maintenance, even for the fan and the thermostat that turns it on and off. Unfortunately, this solar air heater will soon be at least partially shaded. The vacant lot next door is being developed for condos and the new construction will shade the sun from the collector for part of the day. The collector's owners bought a part of the property next door so that their collector will still see some sun and received a settlement from the developer to compensate them for the loss of their sun rights. That money will help pay for the new solar electric panels they've installed on the roof. 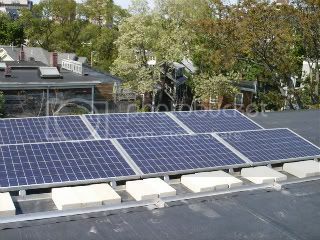 The panels cost around $26,000 and have supplied as much as 2 kilowatts to the household. 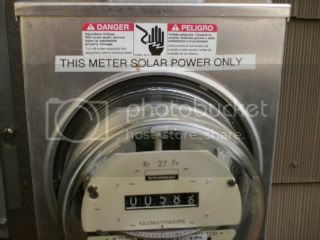 There is a special meter just for the solar array. Some days they even run the electric meter backwards. 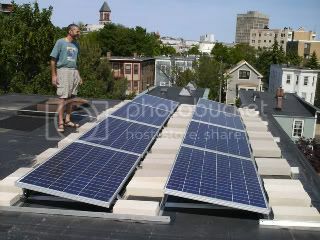 After the state and Federal rebates, the installation will cost around $17,000, less the sun rights settlement. That old solar air heater not only provided reliable space heat for 25 years but will help pay for the new solar electric panels. Not bad. In the course of this recent solar experience, one of the owners approached the city zoning board and the city council about solar shading and zoning. Now the city manager has a committee examining the issue of sun rights and the hope is that soon we will have a policy that will help Cambridge become more of a solar city. 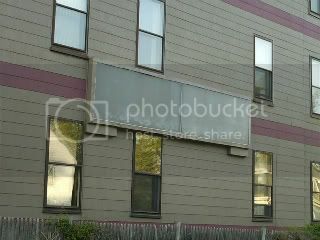 This solar air heater was barnraised by the Urban Solar Energy Association, now the Boston Area Solar Energy Association, in 1980. It was one of six such projects sponsored by a community development corporation (CDC) called Riverside Cambridgeport Community Corporation. 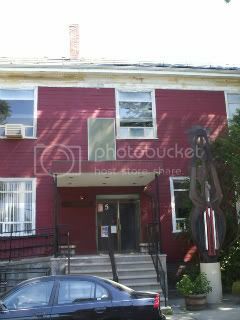 I located another project still around from those days at the Cambridge Community Center in the same neighborhood. I haven't found out yet whether it's still working but the glazing needs to be replaced (there was a 25 year warranty on Kalwall, as I recall). Solar Barnraisings are beginning to come back into style. Reglazing this old collector would be a great way for the next generation of solar barnraisers to start. 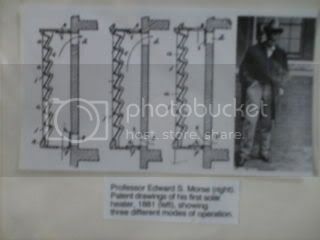 PS: These types of simple air heaters can be modified for summer use to provide solar ventilation and cooling too, as Edward Sylvester Morse's solar air heater from 1881 demonstrated. thx for the info on the years the songs were written, gmoke! 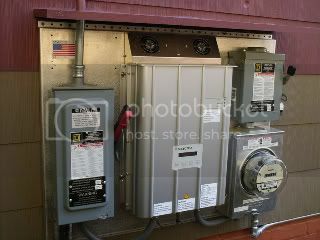 Hey, I’m a new blogger you can find here at solarlightssite.com, and your site is very related to mine; I thought it would be beneficial for both of us to do a blogroll link exchange. Please let me know if you’re interested. His device operated during the winter as a solar heater and in the summer as a ventilator simply by opening and closing the four vents. Friend what a nice information provide from you. I really like your post so much, and mostly well video provide from you. Air ventilator pushes the dusty and hot air out of your workplace keeping the workplace sage and cool. I'm the Director of the Cambridge Community Center. It was great to see our building and collector posted on your blog! 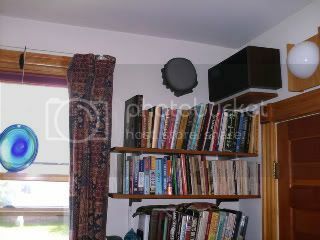 I'm pretty new here, and not very knowledgeable about this type of collector; my impression is that our collector needs renovation. I am pretty sure that the electric motor is not working. In any case, if anyone is interested in doing some barnraising over here, I welcome your interest! 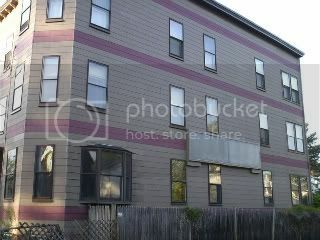 You can reach me at the Center at 617-547-6811. Solar does not pollute our air by releasing carbon dioxide, nitrogen oxide, sulphur dioxide or mercury into the atmosphere like many traditional forms of electrical generations does.